Welcome to my personal little corner of the Web. Here you can find what I have been doing recently professionally, and some links to projects and publications. Currently, I work as a Policy Analyst at TNO, The Netherlands. In this postion I work on projects such as the BDVA, the Once – Only Principle, and projects related to Privacy-by-Design in the age of (big) data. Formerly, I have worked as a Postdoc researcher on the project ‘Privacyspaces – redefining privacy for the 21st century’ at the Tilburg Institute for Law, Technology and Society (TILT), in which I have worked on questions regarding how privacy is influenced by new technologies, and how privacy of the home and privacy in public space have to be revisited from a social, legal and technological point of view. I have published, together with others, about these matters in f.i. Philosophy of Technology, Engineering Ethics and OUP. We also have a book out on Privacy in Public Spaces and there is a nice paper in print on how to think about privacy in the home in relation to smart devices, (forthcoming in this journal. I was also one of the first to research the impact of bodycameras in the Netherlands (see for instance here and here and a newspaper article here). I have also been working in the field of law enforcement technologies, in this project and I was a visiting scholar at the Management school of St. Andrews University, Scotland. Prior to this position, I worked as a lecturer, researcher and designer in the field of ICT and (new) media, where my most recent assignment is to provide the Digital Research Methods course for the Media and Business Master (2013/2014) in the Department of Media & Communication at the Erasmus University Rotterdam. I received a BSc in Industrial Design at the Technical University of Eindhoven and an MA in Media and Culture from the University of Amsterdam. I have defended a PhD thesis in 2013 at the University of Twente in the field of Science-and Technology Studies (STS). 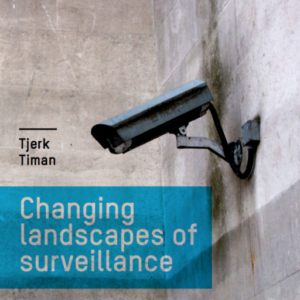 In this project, called “changing landscapes of surveillance – emerging technologies and participatory surveillance in Dutch nightscapes”, I have combined Surveillance Studies, User Studies and Urban Geography to tackle questions of old and new media in relation to (experiences of) surveillance. Via qualitative methods and user studies, I have investigated the use of ICT’s and social media in Dutch city centres. I have published and presented in different disciplines related to this work (f.i. Environment and Planning A, Surveillance & Society). I have presented and organised numerous scientific events, see this page for an overview. Besides academic work, I have been involved in commercial web- and software design and research work, both for large companies (e.g. Philips), smaller studios and institutions and as a freelancer. Occasionally, I am also involved in voluntary work, which often deals with Science Communication (f.i. ScienceCafeEnschede), or Cultural Communication (such as the Rijksmuseum Twente). My recent CV (Europass format) can be downloaded here.